Thousands of residents across Durham and Darlington have given up their free time to take part in the most successful Big Spring Clean campaign to date. Durham County Council’s annual crackdown on litter is run in partnership with LitterFree Durham and Darlington Borough Council and this year saw more than 4,000 people get involved – more than ever before. Despite a number of events being delayed because of the heavy snow, 4,123 bags of litter were collected by residents, schools, community groups and businesses between February and April, making a real difference to the local environment. As well as blighting the environment and making areas look untidy, litter also affects natural habitats and wildlife. 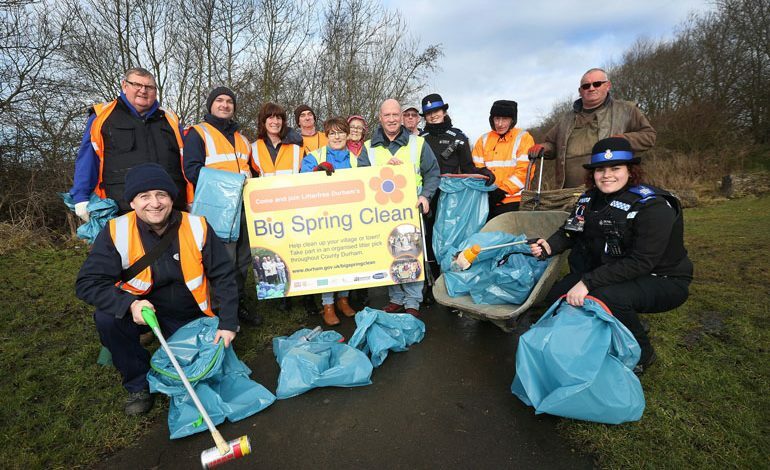 Big Spring Clean, which has run since 2010, encourages and supports residents, businesses and volunteers to organise litter pick activities or events to help tidy their village or town. • 4,123 bags of litter collected in total. Brian Stephens, Cabinet member for neighbourhoods and local partnerships, said: “We are delighted that more people than ever turned out to help improve their communities by taking part in a litter pick and we are very grateful to all those who gave up their free time.